Simply order our Piccolo Twins with your order and for a small price, you can let more of your loved ones be a part of your big moments. 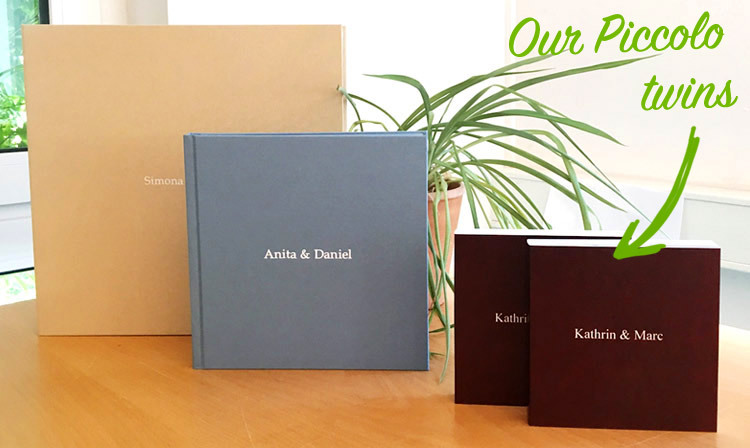 The Piccolo Twins are two small photo albums (14×14 cm) with matching soft covers. Perfect for gifts. Just click the button ‘Add Piccolos!’ in your shopping cart. Two Piccolos in identical colors and with the same title will be immediately added to your order. What type of cover does the Piccolo have? The Piccolo has a thick cardboard cover with a printed title. What size does a Piccolo have? The Piccolos are 14 cm x 14 cm. Why can they only be ordered in pairs? When developing the photos for printing a Piccolo, two books fit exactly next to each other. It would be a shame to only print one!